Over 100 years ago Max Weber, trying to some extent to sum up the research of German historians and sociologists, formulated principles of an approach towards to the history of town. His emphasis on the fundamental difference between the Western town and all other towns has been frequently challenged; however, on the whole, even today it remains uncontradicted. Certainly, there was an active urban life outside of the Western Europe. During the period of traditional society towns of the Far, Middle and Near East, Africa and even America could have substantially surpassed western European towns in terms of population, their political weight, and intensity of urban life. Nevertheless, Weber was right: only the Western town was legally detached from the surrounding territory, and had corporate structures, or, as it was called during the Middle Ages, the “body of town”. Obviously, not all Western towns equally fulfilled this potential. There was a huge gap between the sovereign Republic of St Mark and the small monastic town of St Albans. But it is no accident that Max Weber wrote about ideal types. Theoretically, every Western town had potential to draw near this ideal type. The main thing is that they had this model before them. It is possible to find something similar in other regions, as it is possible to maintain that during the Sengoku period Japanese towns were almost autonomous, that Chinese unions of artisans — hangs — had the same functions as Western craft corporations (mutual aid, quality control, reconciliation of conflicts), and that there are many similarities between Byzantine “Book of the Eparch” and Parisian “Livre des métiers”. However, in these cases it is always necessary to add adverb “almost” or prefix “quasi”. The legally set autonomy or self-regulation appeared only in the Latin West and only starting from the turn of the 11th century. Self-regulating urban communities are, therefore, as much the icon of the medieval Western civilization as notorious “feudalism”, theocratic aspirations of the Catholic Church, universities, and representative assembles. 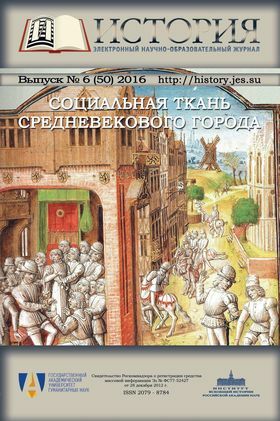 There is the tradition of such approach towards the medieval town in Russian medieval studies, but it is time to analyze this phenomenon systematically. This issue was conceived within the project “Self-organizing Structures of the Medieval Town: Origins, Classification, Mechanisms of Functioning” (the RSF project No. 16-18-10393), but a larger number of researchers in urban history took part in it. The issue is prepared under the direction of Scientific council on the history and anthropology of town, Department of History and Philology, Russian Academy of Sciences. Who Made Decisions in English Monastic Towns of the 13th — 15th Centuries? Tile Kolup and the Cities: Mutual Support Seeking? [Book Review] Chris Wickham. Sleepwalking into a New World: the Emergence of Italian City Communes in the Twelfth Century. Princeton, 2015.